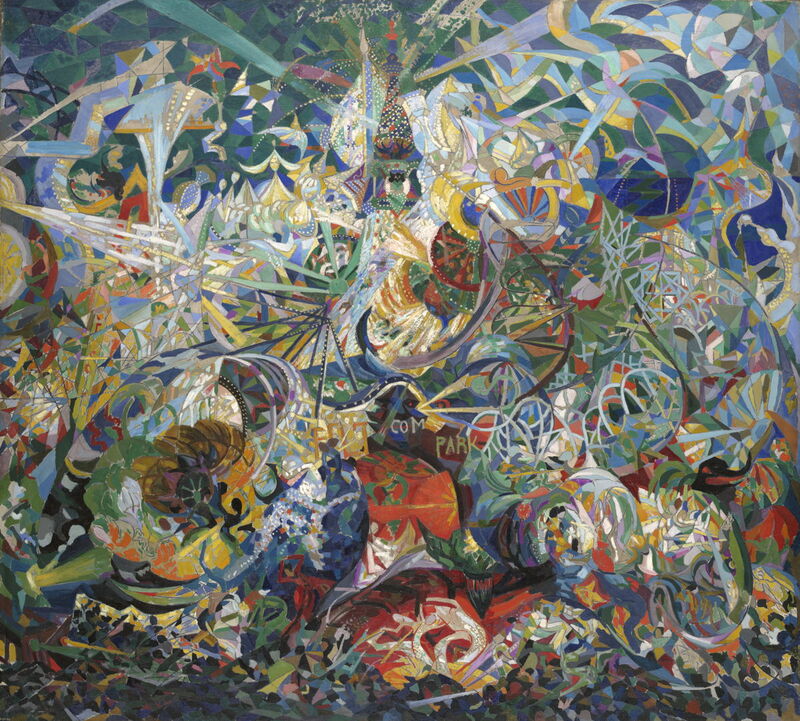 Joseph Stella (1877–1946), Battle of Lights, Coney Island, Mardi Gras (c 1913-14), oil on canvas, 200.3 × 220 cm, Yale University Art Gallery, New Haven, CT. Wikimedia Commons. Over two years ago, as part of articles looking at the career and work of William Merritt Chase, I wanted to write about one of his most brilliant and successful pupils, Joseph Stella (1877–1946). Sadly, at that time Stella’s work was still in copyright, and I couldn’t show any of his paintings here. As that copyright has now expired, I am delighted to be able to complete what I started back in 2016, and tell you a little of his life, and show you a small selection of his paintings. If you don’t know of Joseph Stella’s work, then I think you’re in for a surprise. He was one of the most technically-skilled and versatile painters of the early twentieth century, and eclectic in his styles and motifs. He painted and drew everything from grim industrial sites to phantasmagoric landscapes, in meticulous realist, cubist, futurist and precisionist styles. I think that he is one of the most exciting painters of the twentieth century. Born in southern Italy in 1877 as Giuseppe Michele Stella, into a family of lawyers, his older brother emigrated to the USA to study medicine, and Joseph followed suit in 1896. Like many migrants, he stayed in New York City, but abandoned his medical training in favour of art. He started attending classes at the Art Students League in 1897, and enrolled in the New York School of Art the following year, where he was taught by William Merritt Chase. He attended Chase’s Shinnecock summer school in 1901. One of Stella’s contemporaries was Marsden Hartley. Stella proved very talented, and a brilliant draftsman and illustrator, and in 1902 visited Barbados. 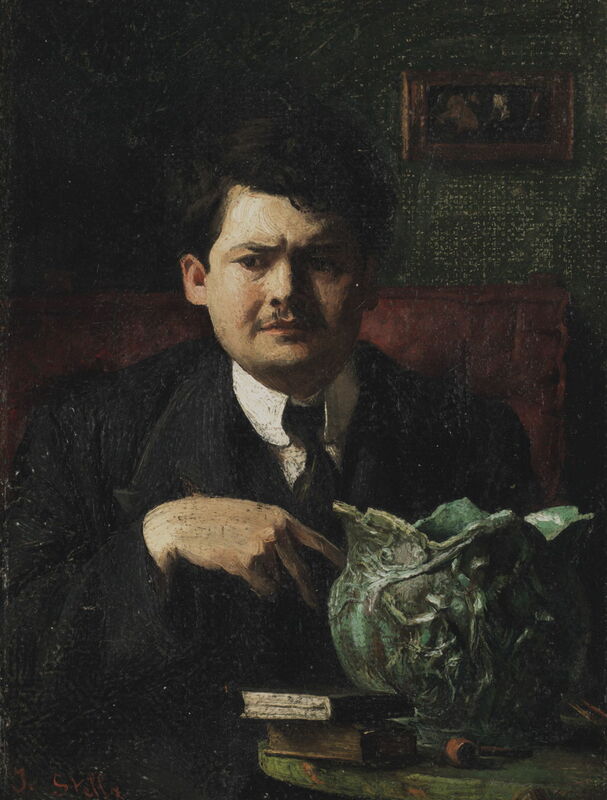 Joseph Stella (1877–1946), Self-Portrait (c 1900), oil on canvas, 20.9 x 15.9 cm, location not known. Wikimedia Commons. Stella’s early paintings are predominantly quite dark and realist, as in this Self-Portrait from about 1900. Joseph Stella (1877–1946), Head of an Old Man (c 1905), Conté crayon on paper, 28.6 x 22.2 cm, Metropolitan Museum of Art, New York, NY. Wikimedia Commons. 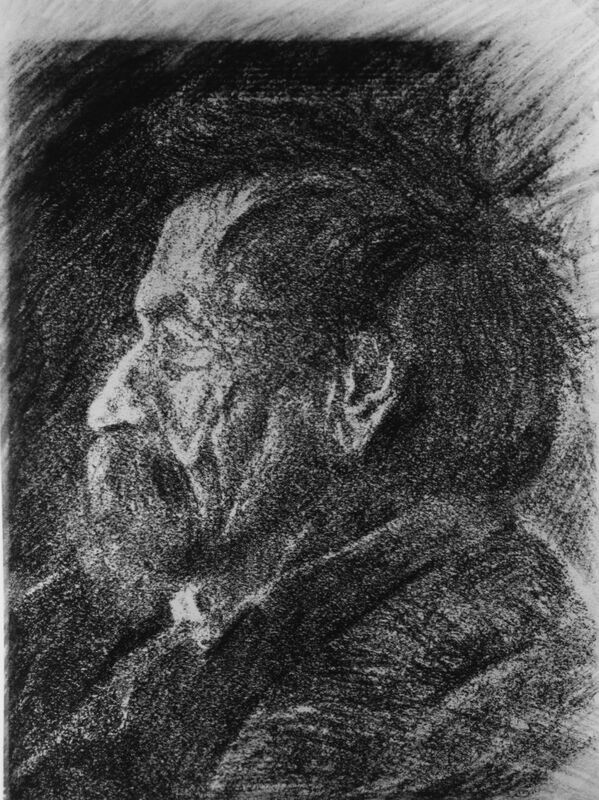 His skill with a Conté crayon is shown in this Head of an Old Man from about 1905. Despite making a promising start, Stella had grown unhappy in New York, and in 1909 returned to Italy, where he came into contact with Modernism, which was popular there at the time. 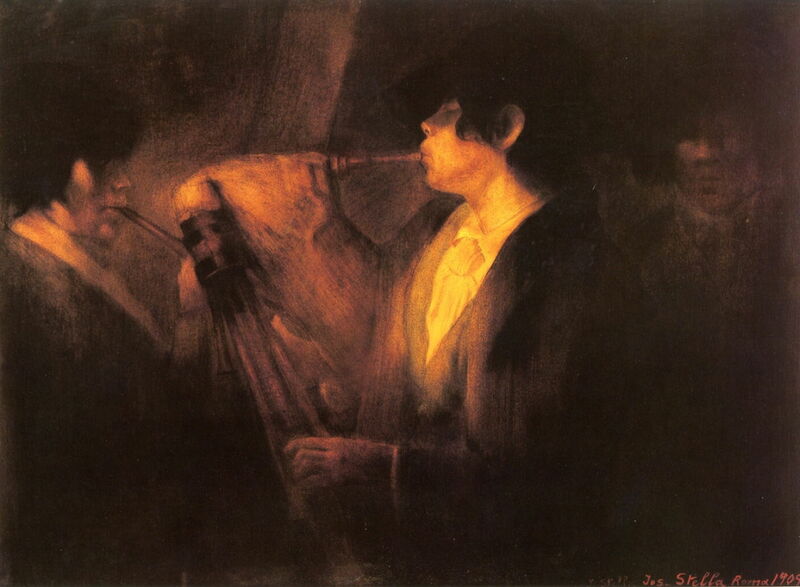 Joseph Stella (1877–1946), The Bagpipers (1909), mixed media on paper on board, 66.7 x 90.2 cm, Private collection. The Athenaeum. At first, this exposure to the modernism of Europe had limited impact on Stella’s paintings. Made when he was in Rome in 1909, The Bagpipers is still quite traditional in style. After two years in Italy, in 1911 he moved to Paris, which was awash with Fauvism, Cubism, and Futurism all in full swing. Then in the autumn/fall of 1912, he decided to give America a second try, and returned to New York City. Joseph Stella (1877–1946), Luna Park (1913), oil on composition board, 44.5 x 59.4 cm, Whitney Museum of American Art, New York, NY. Wikimedia Commons. Stella was attracted to the dazzling electric lights of Luna Park (1913) on Coney Island, which had opened a decade earlier. The style with which he had returned from Paris was startlingly different, and Futurist. 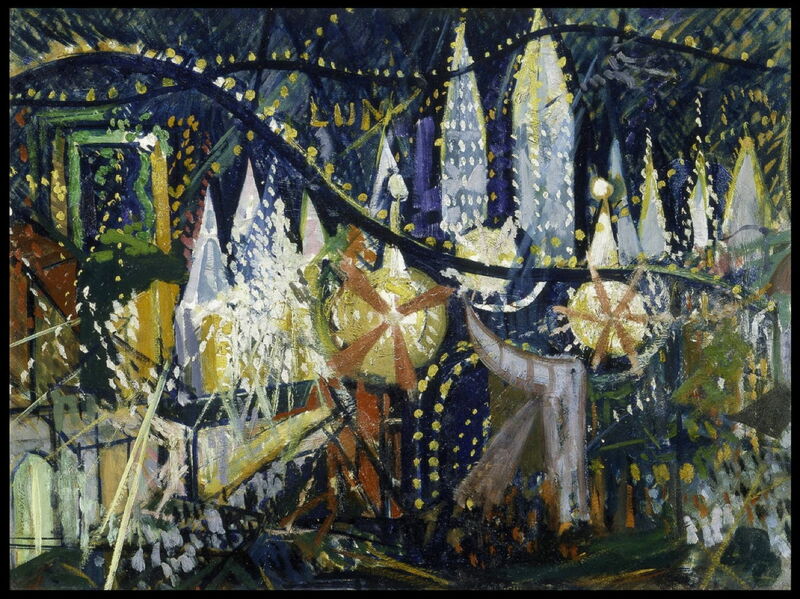 This was followed by Battle of Lights, Coney Island, Mardi Gras (1913), one of the earliest, and still among the greatest, of American Futurist paintings. 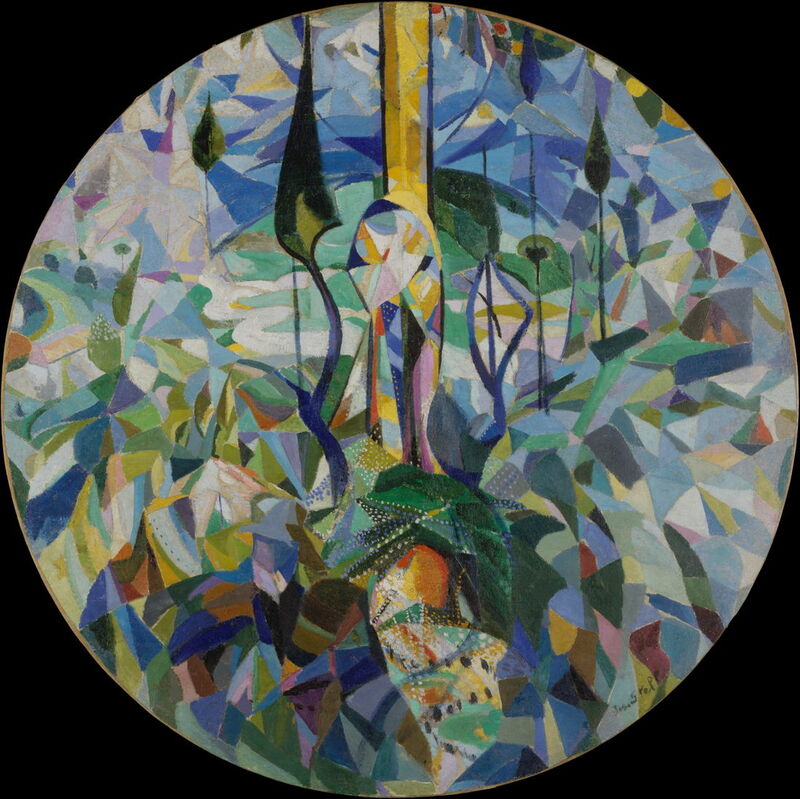 Although it is sometimes claimed that it was exhibited at the famous (even notorious) International Exhibition of Modern Art held in New York in early 1913 – known now simply as the Armory Show – Stella didn’t complete it until the autumn of that year, when it went on display in a private gallery in New York. His reputation among the avant garde had been secured. Joseph Stella (1877–1946), Coney Island (1914), oil on canvas, diam 106 cm, Metropolitan Museum of Art, New York, NY. Wikimedia Commons. The following year, he painted Coney Island (1914). Stella visited Europe and North Africa in the summer of 1914, just before the outbreak of the First World War. Joseph Stella (1877–1946), Telegraph Poles with Buildings (1917), oil on canvas, 92.1 x 76.8 cm, Terra Foundation for American Art, Chicago, IL. Wikimedia Commons. 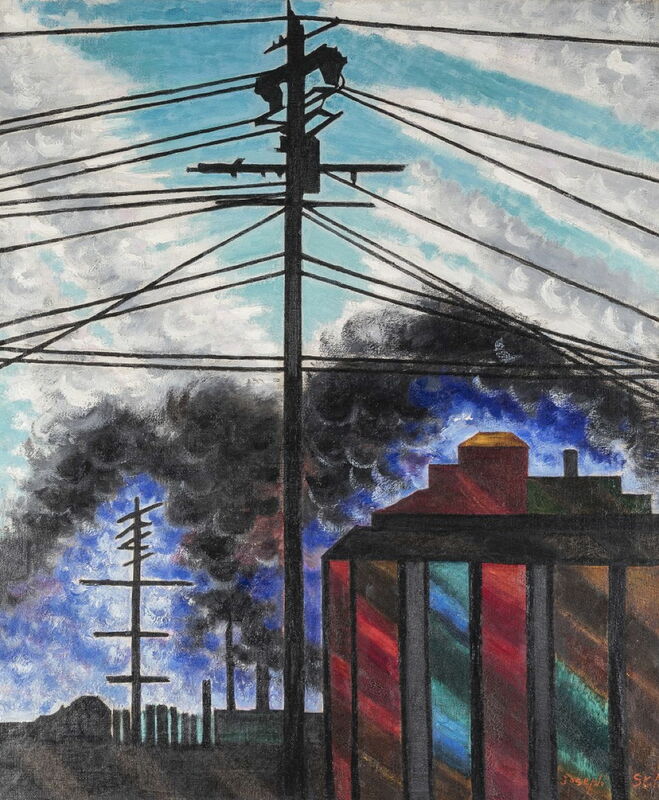 Later during the war, Stella’s motifs and style changed again, concentrating on the smoky skies and factories of industrial America, for example in Telegraph Poles with Buildings from 1917. Joseph Stella (1877–1946), Bethlehem (c 1918), pastel on paper, 30.5 x 41.9 cm, Metropolitan Museum of Art, New York, NY. Wikimedia Commons. 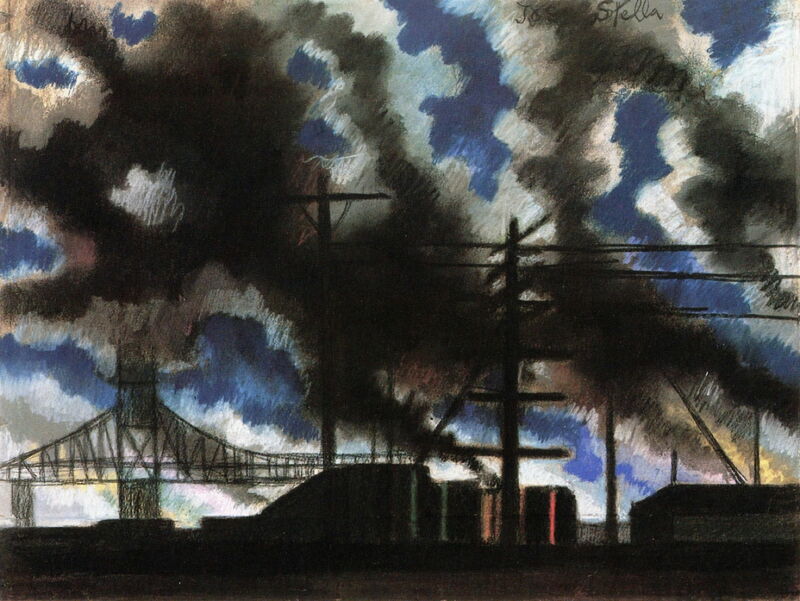 Stella’s Bethlehem, painted in pastel in about 1918, shows the skyline and smoke of this city in Pennsylvania, from the mid-nineteenth century the centre of the steel industry. Joseph Stella (1877–1946), Equal Work/Equal Pay (1918), charcoal on paper, 69.8 x 54.6 cm, Metropolitan Museum of Art, New York, NY. Wikimedia Commons. He also seems to have become involved in social campaigning at the time. 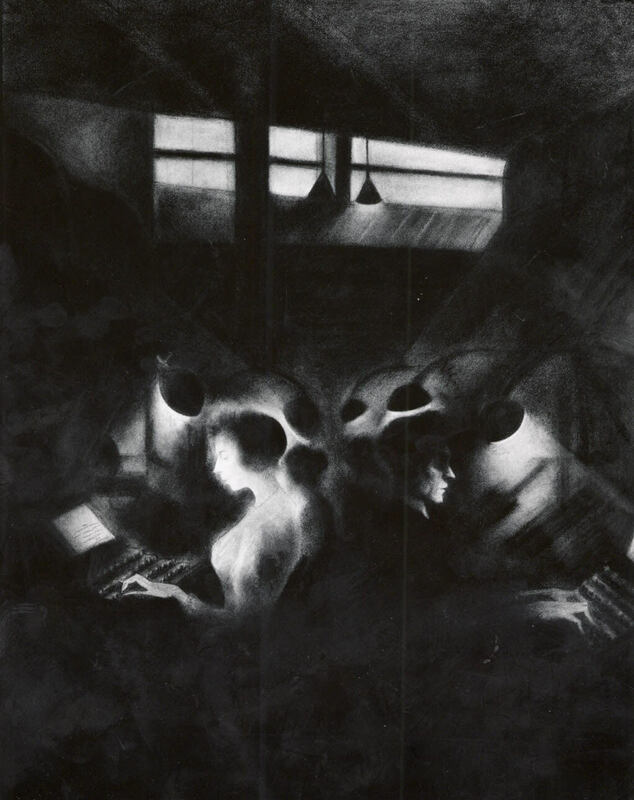 Stella’s atmospheric charcoal drawing of Equal Work/Equal Pay from 1918 shows a woman and a man stenographer (typist, or possibly typesetters) working back-to-back in one of the dimly-lit clerical sweatshops. Posted in General, Life, Painting and tagged Chase, Cubism, Futurism, Hartley, painting, Stella. Bookmark the permalink.